The best drink to touch your lips after hiking 20 kilometres along Heiko’s Trail through Fernie’s spectacular backcountry is a nice cold beer from the Fernie Brewing Company. If you happen to be recuperating on the Bear Lodge patio at Island Lake Lodge and they’re out of What the Huck, however, order a Sunny Side cocktail instead (or do so after you finish your beer). 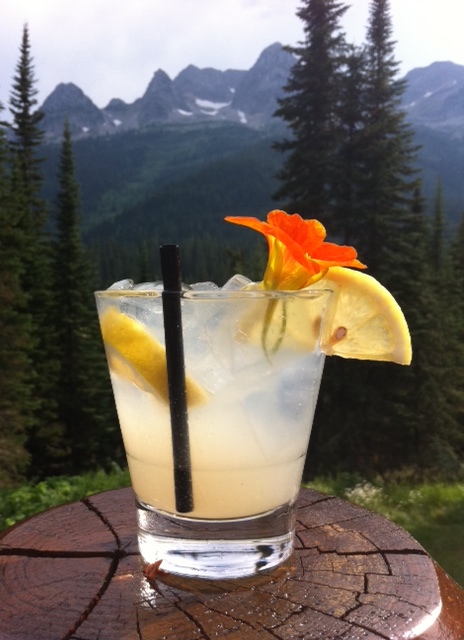 A gin lemonade from Island Lake Lodge is just the thing to ease pain and aid hydration after an epic backcountry hike. I’m all for sipping boozy lemonade on hot summer patios. But when gin is tipped in and the tart, refreshing libation is your reward for eight hours of hiking, the experience is sublime. Cheers! Fill a rocks glass with ice and add gin, then top with lemonade. Stir and garnish with a lemon wedge and a nasturtium. Combine honey with 1 cup water and heat in a saucepan until honey is completely dissolved. Add lavender blossoms, cover, remove from heat and let stand for up to two hours. Strain the infusion and discard the lavender. Pour the mixture into a pitcher, add the lemon juice and remaining 4 cups of water, chill, and serve. This entry was posted in Cocktails and tagged gin cocktails, Island Lake Lodge cocktails, lemonade cocktails, Spirit Bear gin, Sunny Side cocktail. Bookmark the permalink.